← Babylon the Great – The short version. Of the imagery we find in scripture Babylon is another that gives people grief. If we try to define the Babylon we see in Revelation we have to ask, what is it and what are the implications for us? Can I obtain a clue from the passage itself? God had used Babylon to punish Israel for ignoring the Shemittah (times of rest and restoration), because of this they went into captivity for 70 years and might play a role in its utter destruction. Thanks to the interactions we have between Daniel and Nebuchadnezzar, we know that during the reign or Nebuchadnezzar Babylon was great. Daniel – in explaining the statue dream to Nebuchadnezzar – told him that he, as representing Babylon, was the head of gold. Daniel 2:37-38 ESV You, O king, the king of kings, to whom the God of heaven has given the kingdom, the power, and the might, and the glory, (38) and into whose hand he has given, wherever they dwell, the children of man, the beasts of the field, and the birds of the heavens, making you rule over them all–you are the head of gold. Considering that Nebuchadnezzar had threatened to kill all the wise men if no one could tell him the dream and what it meant; it was probably the wiser choice to say, you are the head of gold. However this is not the case anymore. 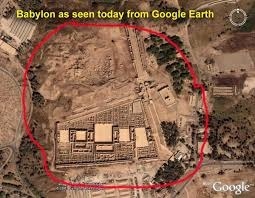 Can we make the connection between a Babylon that was once great and the modern-day world? No, so greatness carries a different connotation these days. Babylon, having served its purpose, was to receive God’s wrath. Jeremiah 51:29 ESV “The land trembles and writhes in pain, for the LORD’s purposes against Babylon stand, to make the land of Babylon a desolation, without inhabitant. Babylon today, surrounded by the city of Mosul in Iraq. When you read this it is easy to say, “that happened and therefore does not apply to today.” We see this same logic applied to the temple of the last days. Jesus predicted the destruction of the temple and Israel saw that happen in 70 A.D.; yet his words also applied to a time in the distant future where there would be a third temple. Therefore these words about Babylon could just as easily apply to a future time, a time which I happen to believe is upon us now. You might not be aware that Saddam Hussein, the late “president” of Iraq, was attempting a restoration of Babylon. He built one of his fortress-like residences on a hill just outside of Babylon along the Euphrates. Chuck Misler – author, evangelical Christian, Bible teacher, engineer, and former businessman. – told us that while active combat missions in Iraq were still ongoing, the military was running high-speed communications cables into Babylon. Does any of that literally mean that Babylon, as a city, would be resurrected to greatness? No, therefore we should be looking for something else, something more symbolic. I believe the key phrase here is “her sexual immorality”. Clearly Revelation 14:8 is speaking about a sensuality, and there is nothing sensual about the region in which Babylon is built. So the context has more to do with something spiritual. Bel Marduk might fit that bill. Since things seemingly went well for Daniel, we assume that all went well for Israel. We also assume that Babylon was just a beautiful, fun-loving place, but that was not the case. If you think about the fact that they threw Daniel’s companions into the fire, then its easier to understand that evil lurked in the background. Babylon was conquered by successive empires, of which two are clearly defined: The Medo-Persian, and the Grecian empires. It is clear that something happened. Now, what do we do with this cryptic sentence – “…she who made all nations drink the wine of the passion of her sexual immorality.” Apparently we know far too little about Babylon because Revelation focuses rather intently on the words sexual immorality. Now again, the question is, how do I perceive and apply this? I had to think about this idea of political unity for a moment. Babylon, a lasting global political power!? I already pointed out that God decreed devastation upon Babylon. Common sense should tell you that Babylon’s ability to persist has to first be spiritual. We are introduced to the beginnings of Babylon in Genesis chapter 10, when we are told about the generations of Noah. The son of Ham was Cush, and Cush fathered Nimrod. Let’s explore this for a minute. Genesis 10:8 ESV Cush fathered Nimrod; he was the first on earth to be a mighty man. “He was the first on earth to be a mighty man”?? 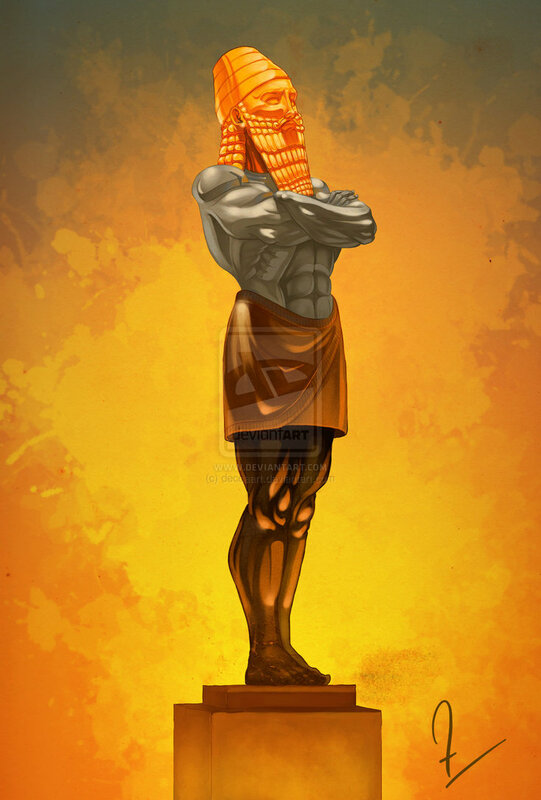 The word mighty in the Hebrew is: gibbôr powerful; by implication warrior, tyrant: Another instance of the word gibbôr used to depict a mighty man comes before the flood, and describes the Nephilim upon the earth. Genesis 6:4 ESV The Nephilim were on the earth in those days, and also afterward, when the sons of God came in to the daughters of man and they bore children to them. These were the mighty men who were of old, the men of renown. Most do not believe Nimrod to have been a giant as much as he was of a reckless ferocity. Reckless ferocity – What names come to your mind? Og, the king of Bashan who may have been 13 feet tall; how about Genghis Khan, or Vlad the impaler. How did Nimrod become the first on the earth to be a mighty man when clearly the earth was filled with violence and there were giants or mighty men prior to the flood? Genesis 6:10-13 ESV And Noah had three sons, Shem, Ham, and Japheth. (11) Now the earth was corrupt in God’s sight, and the earth was filled with violence. (12) And God saw the earth, and behold, it was corrupt, for all flesh had corrupted their way on the earth. (13) And God said to Noah, “I have determined to make an end of all flesh, for the earth is filled with violence through them. Behold, I will destroy them with the earth. Genesis 10:1 ESV These are the generations of the sons of Noah, Shem, Ham, and Japheth. Sons were born to them after the flood. So Noah and his generations are the fresh start. It only took three generations for everything to go sour again. 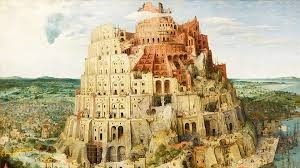 Nimrod was the controlling authority and driving force behind the tower of Babel. That may or may not be the case, but it is clear that all known inhabitants were of the same mind and direction. Genesis 10:8-10 ESV Cush fathered Nimrod; he was the first on earth to be a mighty man. (9) He was a mighty hunter before the LORD. Therefore it is said, “Like Nimrod a mighty hunter before the LORD.” (10) The beginning of his kingdom was Babel, Erech, Accad, and Calneh, in the land of Shinar. Genesis 10:8-10 fills in a few blanks, for it tells us that Nimrod founded the towns of Babel, Erech, Accad (the Accadian race) and Calneh. All in the land of Shinar. I want to you to see something before we move on. Genesis 11:4 LITV And they said, Come, let us build a city and a tower with its head in the heavens, and make a name for ourselves, that we not be scattered on the face of all the earth. If you are anything like me, then for years you read a verse like this and said, how nice, never grasping the depth of what is happening here. It is not as simple as it looks and requires that you dig a little. God has yet to state that he will scatter them, but they almost seem to be prophesying over themselves by declaring: “that we not be scattered on the face of all the earth.” As you know, that happened. If we hear of someone who made a name for himself, there are generally admirable thoughts associated with that, like having a beautiful park named after that person. However there are those that were not so admirable, like: John Wayne Gacy, Charlie Manson, or Ted Bundy. They certainly made names for themselves. Here in America we have Donald Trump. He happens to be running for President, but he has his name plastered on many things he has built. The height and design are not necessarily the issue, and there is something more implicated in Genesis 11:4. I get the sense that they were trying to make their own name or god. So one might conclude that CERN, in a sense, is just another ziggurat attempting to bring the gods down to earth. As to this last quote. Nimrod probably had no concept of Christ, so I do not think it is fair to pin that on him. However, since God found Noah to be favorable (there is a tremendous mystery about this man having to do with the heritage that might intrigue you, but I do not have the time here) you might assume that Noah had a strong concept of who God was. Keep in mind that any knowledge of God had to be verbally passed to the next generations. As the generations begin to rebuild something very dark creeps in and Noah curses one of his sons. It did not take that long for one generation to essentially move away from God. Project this idea three generations ahead and we have Nimrod. Isaiah 21:9 LITV And, behold, here comes a chariot of a man, a pair of horses. And he answered and said, Babylon has fallen, has fallen! And He has smashed the graven images of her gods to the earth. There is a clear sense of multiple gods. The prophet Jeremiah identifies two of them: Merodach and Bel. Jeremiah 50:2 LITV Declare among the nations, and make them hear, and lift up a banner. Make them hear, do not hide it; say, Babylon is captured, Bel is put to shame, Merodach is broken in pieces, her images are put to shame, her idols are broken in pieces. Back to Mark Hitchcock’s book – The Second Coming of Babylon. Make no mistake, God is, and has always been in control. Man, living in the illusion that he is in control, found out differently, for God came down and confounded their language, and scattered man across the face of the earth. Thus ended the first global community. “Globalism was put on hold. So in trying to understand what Babylon is, keep this passage in mind. We are looking at power structures, guided by the gods of greed and sensuality. Look around you. If you watch television sensuality is shoved down your throats on a daily basis – you want, you need, you cannot live without. Power structures, however, are sometimes hidden in plain sight. Examples are: the NWO, Illuminati, the Bilderberg group, and men like George Soros. Our musical and entertainment icons are constantly flashing Illuminati symbols at us. 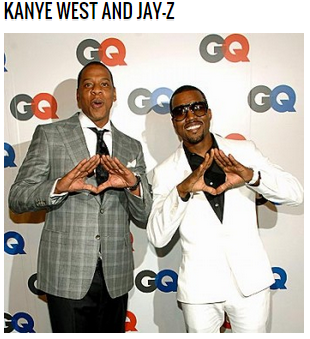 Kanye and Jay-Z flashing an Illuminati sign. I am telling you, you need Jesus Christ, because this is all coming to head quickly, and I foresee nothing but pain coming upon the earth. iJohn F. Walvoord, “Revelation” in Bible Knowledge Commentary, ed. John F, Walvoord and Roy B. Zuck (Wheaton, Ill: Victor Book, 1993), 2:970-71. 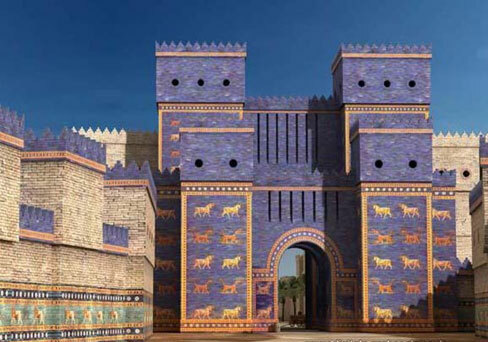 Babylon the Great – The short version. This entry was posted in Apostasy, End times, Prophetic, Thoughts, Thoughts on scripture and tagged Babylon, Bible, Bilderberg group, end times, false religion, future, Illuminati, last days, Marduk, Nebuchadnezzar, New World Order, prophecy, Revelation, Saddam Hussein, Scripture, sexual immorality, Whore of Babylon, ziggurat. Bookmark the permalink. 1 Response to Babylon the Great – the long version. Revelation 14 verse 8. Very interesting. I also think the dream of Nebuchadnezzar is an image of Apostasy and that this apostasy extends from Cush until the Second Coming of Christ. If so, then the gold head, silver arms and chest, the brass belly and private parts, and the iron legs must all represent aspects of the character of this Apostasy as it is played out in history. Perhaps understanding these characteristics will help us defend ourselves from Antichrist.